While many “cat people” will argue that cats do love their owners, many others remain unsure, never having experienced affection from cats. Unlike their dog counterparts who actively seek out affection from their owners, cats often come across as uncaring and standoffish. So, what do they really feel about us? 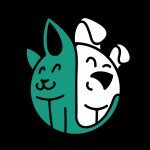 Do Cats Love Their Owners? According to Science – Yes! 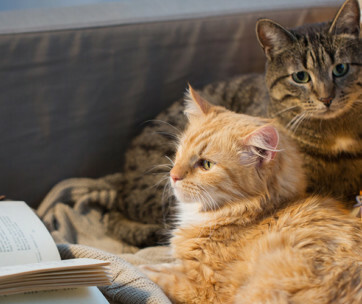 According to a study done in Sweden, cats love their owners and – get this – show it! In this particular study, cats were left alone at home for two periods – 30 minutes and 4 hours. 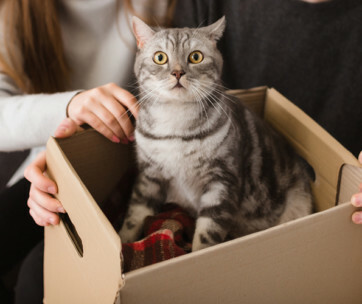 Upon the return of their owners, the cats actively sought out social contact from their owners, highlighting the importance of humans in their social lives. 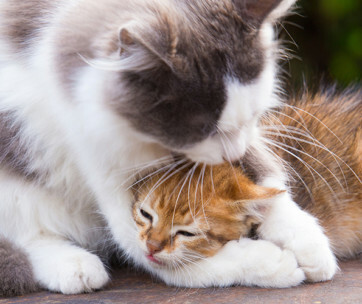 Now that science has provided an answer, how can humans recognize when cats show affection? Luckily, cats show affection in many ways. Here are just a few. A cat that is enjoying being stroked or is feeling relaxed will often purr to show his gratitude and love. Purring is the most obvious display of affection and comes from a little motor inside their throat that vibrates. While it should be noted that cats also purr when in pain or upset (and should be taken to the vet in this case), this doesn’t happen often and you will be able to tell the difference. Most times, though, a purring kitty is often feeling reassured, safe and secure around you. Cats display a huge amount of emotion through the position they hold their tail in. Unfortunately (or fortunately – depending on how you look at it), identifying when a cat is upset or threatened is easy. However, when a cat is showing that they like you, they will often twirl their tail around the legs and arms of those they like. 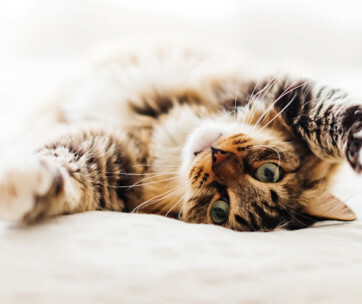 Another way is to tell whether your cat is saying, “I love you,” is by holding the tail upright with a curve at the top while fluffing up the base of the tail. Grooming their owner, that is. That’s right. Your cat is not just trying to tell you that you need a bath – or are they? Grooming – specifically licking – is a way for cats to mix their scent with yours Why? It establishes a family scent that helps them recognize their community, helping them feel relaxed and show trust. Cats have pheromone-producing scent glands on their cheeks. Rubbing cheeks with those they trust is another way to combine scents and is often a sign of affection as well as an invitation to socialize. Try extending a finger towards your cat at his nose level. If he is open to socializing, he will turn his head so that your finger is on his cheek. This is also a good way to approach cats you don’t know. Slow blinks and half-closed eyes indicate that your cat is enjoying your company. A relaxed cat will often convey trust and affection with these slow blinks, also called cat kisses. Guess what? You can reciprocate them! Your cat may respond with more cat kisses, helping to strengthen the bond between cat and owner. Head bunts or head butts are yet another way for cats to mingle their scent with you and proclaim ownership (who’s the owner now). The scent glands in your cat’s head transfer his scent to you, hereby marking you, all in the name of love and friendship, of course. Picture this, you get home and your cat runs up to you, throws himself on the ground and starts rolling around and shows you his belly. This is your cat’s way of showing his excitement to see you and need for your attention. What a great way to be welcomed home, right? You may think that your cat is messing up your furniture but a cat often scratches areas most associated with the owner – your favorite spot on the couch for example. Scratching leaves visual marks of ownership as well as a scent, helping to solidify that sense of family. Has your cat ever flung a dead rat at your feet or in your lap? They’re not trying to scare you. 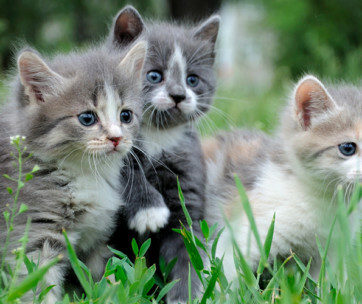 Cats show affection to humans by gifting prey. Even though they are domesticated, they are still hunters at heart, sharing their bounty with those they love – and that’s you. Be sure to give them some praise when they do this, even though it may be tempting to screech in disgust and run away. Lions sleep for up to 20 hours a day. Your little lion also needs his beauty sleep and can sleep for up to 16 hours a day. This is a vulnerable time for cats, so their sleeping location needs to be a trusted, safe space. If your cat loves and trusts you, they will sleep near or even on you, lovingly yet unknowingly forcing you to stay in one position for extended periods of time. Conclusion: Do Cats Love Their Owners? Despite their bad reputation for being distant and uncaring, cats really are affectionate creatures that are actually really good at communication. Cats do love their owners – they just have their own way of showing it. We humans just need to look for the signs. And judging by their methods of showing affection, they choose when and how to do it, not us.